I was working in a bookstore in Austin, Texas when the first original Star Wars novel – Heir To the Empire – was published in 1991. The book hit the New York Times best sellers list, and to use a cliche, I remember that book flying off the shelf – purchased by Star Wars fans young and old eager for new stories in the Star Wars universe. Heir to the Empire is part of the Star Wars expanded universe, and takes place five years after the events of Return of the Jedi. 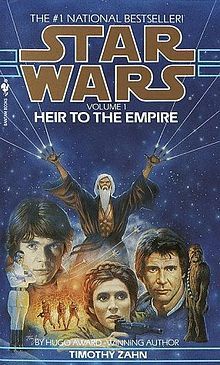 Heir to the Empire was the first novel in the Thrawn trilogy written by Zahn, a popular hard science fiction novelist, and it ushered in a stream of widely read and loved Star Wars media tie-in novels. The Star Wars publishing program has been going strong ever since – numerous Star Wars universe novels written by many well known science fiction writers including Kevin J. Anderson, Steven Barnes, and many others. 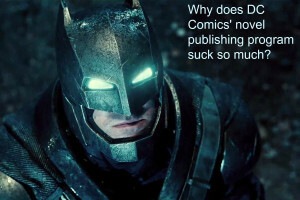 With the debut today of Batman v Superman: Dawn of Justice, it’s worth asking. Why haven’t DC or Marvel been able to replicate the success of Star Wars (and the perennially popular Star Trek media tie-in novels)? Is the comic book fan base just not interested in novels featuring their favorite super heroes and super villains? Are these characters inherently popular only in the graphic format of a comic book or on a movie screen? If you look at the strong success of the Star Wars and Star Trek media tie-in publishing programs, I’d argue that that’s not the case. For both companies, the media tie-in publishing strategy seems scattershot at best, with no overarching plan or strategy. DC has tried. The Last Days of Krypton. 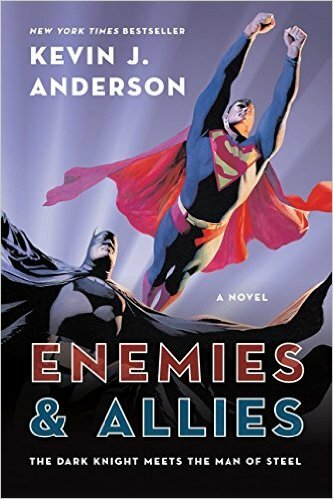 As America and the Soviet Union race to build their nuclear stockpiles, two extraordinary heroes must form an uneasy alliance. These studies in opposites – shadow and light – must overcome their distrust of each other to battle evil and injustice. Sputnik silently circles in the skies above the fabled cities of the United States as danger lurks in the Earth’s darkest corners. In Gotham, the shadowy vigilante known as the Batman haunts Gotham’s streets … and the police are just as afraid of this Dark Knight as the city’s criminals are. In Metropolis, the notorious Lex Luthor is leveraging international tensions to build LuthorCor into a military-industrial empire, competing against his business rival Wayne Industries, which is run by Gotham’s enigmatic millionaire, Bruce Wayne. Luthor’s activities have raised teh interest of Daily Planet reporter Lois Lane, who is beginning to realize that Luthor may stop at nothing to achieve success. At the same time, Clark Kent and Jimmy Olsen are investigating the rumored crash of a flying saucer. Clark is desperate to know if there may be other lost interplanetary visitors on Earth secretly living among them – visitors like himself. 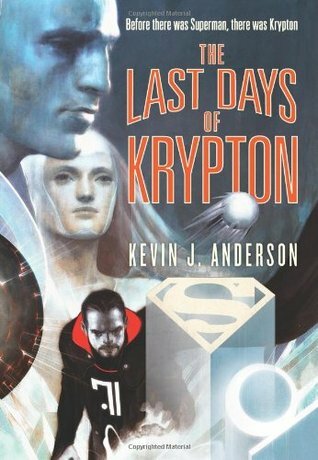 The Last Days of Krypton is a 2007 novel that chronicles the rise of General Zod, and Jor-El’s history, up to the destruction of the planet Krypton. It merges elements of many disparate versions of the Superman mythos into one coherent story. 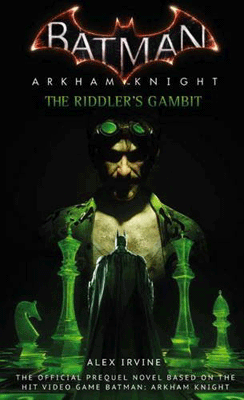 Recently, there have been a few paperback original Batman novels: Batman Arkham Knight The Riddler’s Gambit by Alex Irvine (a Batman video game tie-in novel – how’s that for meta fiction), Batman: Inferno by Alex Irvine, Batman: Dead White by John Shirley, and Batman: Fear Itself by Michael Reaves and Steven-Elliot Altman. Despite striking, exciting covers that evoked everything there is to like about the Batman character, none of these books were bestsellers. Currently, with the exception of a JR novelization for kids listed, there is no official Batman v Superman novelization available at bookstores. (If that changes, I’ll update this post). What does that lack of a basic movie novelization tell you about DC’s commitment to pursuing a robust Batman media tie-in novel universe? That decision leaves me scratching my head. Why not double-down and fully commit to a vibrant Batman and DC Comics novel publishing program? These characters are iconic pop culture icons – Batman, Superman, Wonder Woman, The Flash, Green Lantern, Aquaman, etc. Why not publish short story anthologies featuring best-selling science fiction, fantasy, and comic book writers chronicling their favorite superheroes in prose? Why not approach best-selling crime writers about writing Batman or DC Comics novels or novellas? Can you imagine a Lee Child Batman novel? Sure, maybe Lee Child would turn them down. But, I’m sure DC would find popular, best-selling crime and mystery writers eager to write a DC Comics story. And, a strong, visionary editor could plot out a 2 or 3 year plot and character arc that plays out across multiple novels and multiple superheroes. Right now, none of that is happening. Instead, Batman and DC Comics fans have to resign themselves to random, hodge podge Batman novels occasionally being published with no overarching strategy or thought. Sad . . .